Hello, and welcome to this guide. This guide is a redesigned and updated version of the Guide to Equipment made by Resilience. Some of the information is gathered from that guide, and some of the information are gathered from other users (see list below) and from me. Please help out with gathering information for this guide, by going to this forum thread! Check out this forum thread if you're looking for which equipment you should not transmute, the equipment that is still needed in some epic battles. If you have any questions or suggestions regarding this guide, feel free to come with them in this forum thread or on my wall! Last edited by Choccy on Feb 17 2018, 8:38am, edited 11 times in total. If you're on a mobile device, just scroll down. Last edited by Choccy on Aug 23 2017, 7:23am, edited 6 times in total. 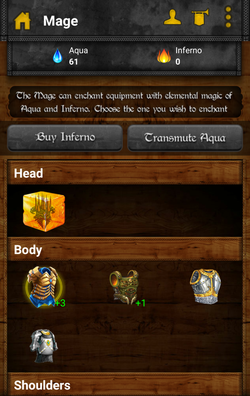 1) First off, you will need to unlock The Mage to upgrade equipment. 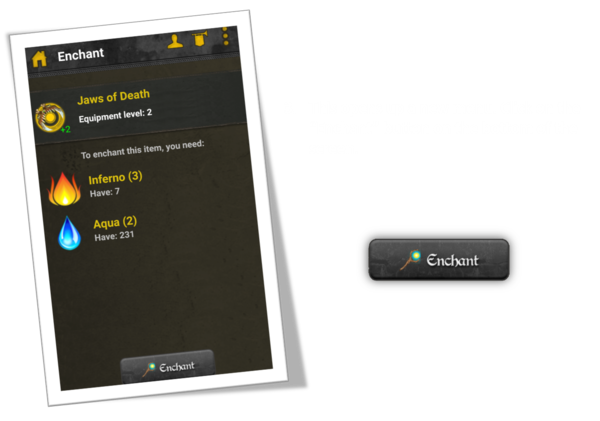 2) Secondly, you need to obtain items that the Mage can use to enchant.  3) Thirdly, you have to earn equipment can be enchanted. All these points will be explained below. Last edited by Choccy on Aug 23 2017, 7:23am, edited 5 times in total. Last edited by Choccy on Aug 23 2017, 7:24am, edited 7 times in total.  To gain access to The Mage, you need to upgrade your the Castle to level 3. You will need to open at least 12 Highlands to unlock the ability to upgrade the Castle, and it will cost 10,000,000,000 gold to upgrade from level 2 to level 3.  It can only be undone if the equipment resets during an attempt to enchant. Last edited by Choccy on Aug 23 2017, 7:27am, edited 8 times in total. Here is a list of all the equipment dropped from epic battles, purchaseable war equipment, and banners/avatars. Please note that event and limited time equipment and other equipment that are no longer available to be obtained is not included in this guide.  If you are on a mobile device, you may need to scroll down to find the equipment. Last edited by Choccy on Feb 17 2018, 8:44am, edited 32 times in total. Last edited by Choccy on Aug 23 2017, 7:51am, edited 4 times in total. If you think that you're missing from this list, please contact me on my wall! Last edited by Choccy on Aug 23 2017, 7:52am, edited 14 times in total. Last edited by Choccy on Feb 17 2018, 8:42am, edited 7 times in total. Thanks for reading the guide. Last edited by Choccy on Nov 21 2015, 5:55am, edited 3 times in total.